At Friday I had one start: 50mFly. With 27,84 (39. place of 52) this was indeed not really good. 0,2s over best time and only 0,1s faster as at the local test competition the week before with 8 starts at one day are not acceptable at such a competition. Anyway – I swim stable below 28s. At saturday I took the 100mBack. At the moment backstroke is not going so well. I dont have bad water sense and my times are not really bad but not as good as they should be. But with 1:04,16 (17. place of 29) I was doing quite well this time. After all this is only 0,18s slower than best. One hour later I had the 100mFly at my schedule. And there the knot was cut: 1:00,82 (28. place of 42)! Yeah! At sunday I started with 50mR in 30,13 (26. place of 37). Doing this I exactly confirmed my best time from the german masters championships in Regensburg. The start was perfect, the diving period was great and my arms were doing a rotation. Unfortunately I got the wall very unfavourable, I decided to do one more arm pull – and nearly hit the wall with my head. I can do it – could be improved – but I can still backstroke! 45min later the 200mFly were on schedule. My recovery period mas not yet finished even if the time should be enough. Because of this my mind was not completely freed. Anyway the start was the worse of the worst: 0,93s reaction time and pure tilting over from the starting block! In the water it was much better. With 1:05min at 100m I started quite well, but because of fear of a collapse I reduced the intensity at the 3rd lane. Unfortunately I switched over to once breathing a little bit too much. Three times at the turns I got a very bad arm rhythm and this took also time. At the end I good a very good 2:17,53. This is anyway the seconed fastest time I ever swam. With 22. place of 24 I met my target for this competition: I wanted to be never the last. The German Masters Championship „Long Distance“ is one of my the most important highligts in the season for me. This means intensive preparation, adapted holiday planning and of course estimation of the chances. This year I finally start in the age group 30 and therefore the cards are drawn new. In Osnabrück in the last year thre were some really good times in the age group 30. And I hoped for a new duel against Tim Spiwoks, who was 2 years ago a though opponent in Berlin in the age group 25 and who was during the last year in Osnabrück in top condition. Unfortunately Tim did not start Köln and the other opponents were not that fast. The competition began with 400m medley. I have everytime a high esteem for this track at the German Masters Championships. But I feld well and had a lot of power in my arms. Slightly over-motivated I began with 1:04,79 at the part track 100mFly. This is really a little bit tough. ;-) The tough start claimed tribute at the 100mBack: only 1:18,77 as pass time. Nevertheless I was good in the race. After 100mFly I had a comfortable lead, but this is normal as a butterfly swimmer. At the part track backstroke Daniel Petrella closed up a little bit. When I recognized this I was slightly surprised because at 400m medley I have my stronges parts at the first two parts and in the next competition (200mBack) I had to be awar of this. Part track breaststroke was quite ok with 1:31,39 and with 1:08,97 over freestyle I barely had a small buffer. But I have noticed that Daniel closed up very fast with 1:04,65 over 100mFree (almost flying). Furtunately the I got the wall earlier! 5:03,92 was the final time, which was more than 1s best time and the first place. Yeah! At the same day at afternoon I swam the 200mBack. Of course I chatted with Daniel a little bit and he opened to me that his focus was on the freestyle competitions. (Ok – this makes his freestyle split time over the 400m medley clear.) And he also said that 200mBack is not so smooth at the moment. I hardly beleaved this, but he startet one heat earlier and with 2:30,30 he was no danger to me. Therefore I had no glue how the 200mBack would be. I decided to swim tactically, this means always one arm length ahead and controlling the opponents. This strategy met and I got with 2:19,58 the title. Now I am curious for the Germand Masters Championship „Short Distance“ in Sindelfingen. Maybe I get the triple title in the age group 30 over all backstroke distances? Anyway – I have to improve my backstroke – especially with the focus on the EM Masters! 200mBack is simply the track where I got the highest chances. At the second day the 200mFly was the only track. A best time it had to be and when I read in the official confirmation that no top favorites would be there I had realistic chances for the victory. 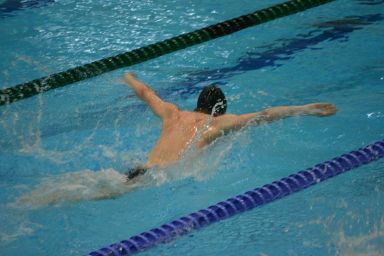 Unfortunately two other opponents did not start and so I had to swim without serious opponents. Therefore I gave everything for a new best time – and was rewarded: 2:16,78 – which means 2 seconds faster than the old best time! Wow! THIS was fast. I think everybody in the pool noticed my ecstasy. ;-) I startet with 1:04,13 – quite fast. At the last day there were only the 400mFree. This track I chose to have at least a single start at this day. This time Daniel Petrella was able to show that he really is an excellent freestyle swimmer. He got the title and was completely unreachable for me. I solely got a new best time (4:36,43), and I am very happy about that. This was enough for the 5. place. But my race arrangement was not really good: 1:06,25 as start over the first 100m is not acceptable. And also the split times 1:11,45 and 1:11,40 at 200m and 300m could be better. I think I was in fear of a collapse. Therefore I swam it „korean style“ as Park Tae-hwan: Maximum at the last 50m and with this remarkable 1:07,33 as split time over the last 100m. Ok, this were the German Masters Championships „Long Distance“. And it was worthwhile: 3 titeles and 3 best times. After the ski holidays in Austria I came back home at the 27.12. and could not stop myself. The luggage was not yet unpacked and I went to the pool. After more than a week no swimming I simply had to go. I had to go into public swimming but it was quite ok. At the next day: throat ache. Therefore I did not want to do something stupid and did not do swimming. Unfortunately it was not enough. I got a really strong cold with fever. New years eve I spend in my bed. Then when the cold vanished I noticed a strong reduced appetite and a reduction of the muscles for energy gaining.